Stephanie Stebich, executive director of the Tacoma Art Museum in Tacoma, Wash., since 2005, has been named The Margaret and Terry Stent Director of the Smithsonian American Art Museum, effective April 3. Stebich was assistant director at the Minneapolis Institute of Arts and the Cleveland Museum of Art and served on the board of the Association of Art Museum Directors and currently serves on the board of the American Alliance of Museums. As head of the Tacoma Art Museum for almost 12 years, Stebich has raised funds for a major renovation that doubled the museum’s exhibition space, developed and implemented a strategic plan as well as a 10-year collection plan. She increased the collection by 2,000 works of art, including the Haub Family Collection of Western American art and art of the Northwest. She added major pieces to form the largest collection of works in glass by Tacoma native Dale Chihuly on view in a museum. She also developed through gift and purchase the most important collection of studio art jewelry by artists from the Northwest and one of the nation’s premier western American art collections. Stebich is known to be an effective fundraiser—she launched a capital campaign with a goal of $17 million in 2010 and has raised more than $37 million to date. She increased the full-time staff by 20 percent and added endowed curator, educator and fellow positions in recent years. More than 100 exhibitions opened during Stebich’s tenure, including Matika Wilbur’s “Project 562,” “Edvard Munch and the Sea” and “Art AIDS America” and traveling exhibitions of works by Norman Rockwell and Georgia O’Keeffe. As a trustee of the Association of Art Museum Directors, Stebich chaired the membership committee leading a major effort to enhance diversity in museum leadership. As a trustee of the American Alliance of Museums, she chairs the global steering committee and is the incoming national program chair. As assistant director of the Minneapolis Institute of Arts (2001–2004), she was responsible for visitor services, public programs, interactive media and special events. Stebich also co-chaired a free city-wide festival of world arts. 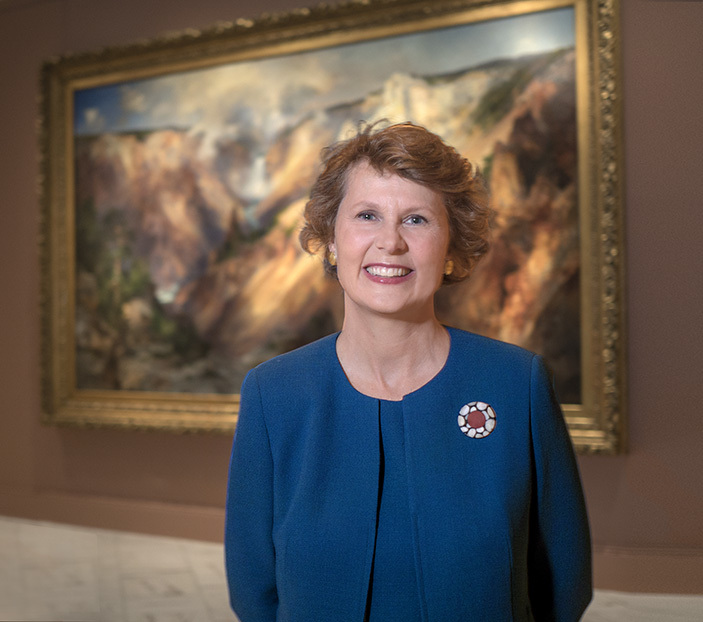 During her six years at the Cleveland Museum of Art (1995–2001), Stebich coordinated the strategic and facilities planning processes in support of the director and board of trustees. She managed the architect selection process for the major expansion and renovation project. Stebich grew up in Scarsdale, N.Y., and graduated from Phillips Exeter Academy in Exeter, N.H. She received her bachelor’s degree from Columbia University and her master’s degree at New York University’s Institute of Fine Arts. In addition, she has a certificate in non-profit management from Case Western Reserve University in Cleveland and is a graduate of the Getty Leadership Institute in Los Angeles. She was a fellow at the Guggenheim Museum and studied at the University of London’s University College. She is fluent in German and French. The Smithsonian American Art Museum is the home to one of the largest and most inclusive collections of American art in the world. Its artworks reveal America’s rich artistic and cultural history from the colonial period to today. More than 7,000 artists are represented in the collection, including major masters such as John Singleton Copley, Gilbert Stuart, Winslow Homer, John Singer Sargent, Mary Cassatt, Georgia O’Keeffe, Edward Hopper, Joseph Cornell, Jacob Lawrence, Carmen Herrera, Christo and Jeanne-Claude, David Hockney, Roy Lichtenstein, Kerry James Marshall, Nam June Paik and Irving Penn. In recent years, the museum has strengthened its commitment to contemporary art, and in particular media arts, through curatorial appointments, endowments, awards, acquisitions and commissions. The museum has been a leader in identifying and collecting significant aspects of American visual culture, including photography, modern folk and self-taught art, African American art, Latino art and video games. The museum has the largest collection of New Deal art and exceptional collections of contemporary craft, American impressionist paintings and masterpieces from the Gilded Age. Its branch for contemporary craft and decorative art, the Renwick Gallery, is located in a National Historic Landmark building steps from the White House. A comprehensive two-year renovation (2014­–2015) included completely renewed infrastructure, enhanced historic features and other upgrades to the building that make it a 21st-century destination attraction. Since reopening in November 2015, the Renwick has pointed to new directions in the field of craft with a revitalized program that combines tradition with contemporary design and programming. The inaugural exhibition “WONDER” attracted more than 732,000 visitors in its eight-month run, and created a sensation on social media. The museum maintains six online art-research databases with more than a half-million records, including the Inventories of American Painting and Sculpture that document more than 400,000 artworks in public and private collections worldwide and extensive photographic collections documenting American art and artists. An active publications program of books, catalogs and the critically acclaimed peer-reviewed journal for new scholarship American Art complements the museum’s exhibitions and educational programs. Last year, the museum surpassed its campaign goals for financial gifts and significant art gifts, a combined total of $105 million, with more than one year remaining in the campaign. The $65 million cash goal was exceeded by $3 million, with approximately one-third going to support the renovation of the museum’s historic Renwick Gallery and the addition of a state-of-the-art education center in the museum’s National Historic Landmark building, and another third enhancing the museum’s endowments. The campaign will continue through 2017 with a focus on additional artworks and endowments to support curatorial, technology and education initiatives. The search committee was chaired by Richard Kurin, the Smithsonian’s Acting Provost/Under Secretary for Museums and Research and included Melissa Chiu, director, Hirshhorn Museum and Sculpture Garden; Jim Dicke, past chair, Smithsonian American Art Museum Commission; Steve Hamp, chair, National Portrait Gallery Commission; Betty MacMillan, past chair, Smithsonian American Art Museum Commission; Nion McEvoy, chair, Smithsonian American Art Museum Commission; Virginia Mecklenburg, chief curator, Smithsonian American Art Museum; and Carlos Tortolero, director, National Museum of Mexican Art, Chicago. Robert Kogod, member of the Smithsonian Board of Regents, served as an advisor to the committee.